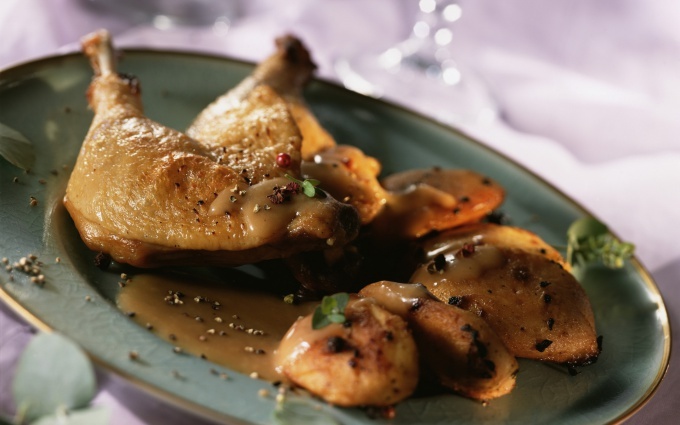 Very tasty, flavorful and nutritious roasted chicken with potatoes one of the most famous dishes. But in a familiar dish can bring something new and give it a new taste. You could give the dish a favorite flavor and aroma, using its herbs and spices. The recipe also includes a sauce served to the main dish. The cooking technique is quite simple and does not require a lot of time and special skills. Rinse the chicken under cold running water and have to portion. Prepare the filling. For this garlic is clean and skip through the press. In olive oil, add the soy sauce and whisk. Connect to a mixture of garlic, paprika, Basil, ground black and Cayenne pepper. Mixture beat well. Place the mixture in the chicken and leave to marinate for 30 minutes. The potatoes should be rinsed thoroughly, as it is made in the skin. Cut potatoes lengthwise into 6-8 slices, place in cold water and place over a high heat. After boiling, cook the potatoes for a few minutes and drain in a colander. Put the potatoes on a paper towel to dry. Put the chicken in the pan and fry on high heat on both sides. While fried chicken, place in a bowl of dried potatoes and leave for 10-15 minutes to soak. Attach the potatoes to the chicken and cook under closed lid on low heat for another 20-25 minutes, stirring occasionally. Prepare the sauce. For the mushrooms and slice onions into very finely. Saute mushrooms in small amount of oil until tender. Stir in cream flour, to avoid lumps, add salt and pepper. Pour the cream into the mushrooms, saute on low heat until thick. Pour the mixture into a blender and blend until smooth. The finished chicken with potatoes decompose in portions and serve with mushroom sauce and fresh vegetables. Instead of mushrooms you can use any fresh mushrooms or dry mushrooms. Dry mushrooms with the pre-soak and boil until tender.